Retro Soarin Pic from my sons first trip to Walt Disney World in 2011! When you visit Walt Disney World you are bound to experience some liquid sunshine. Rain is just part of the Florida climate. When it starts raining you may see a lot of guests head out of the parks which means there will be some reduced wait times for those who wish to brave getting a little wet. Some rides do close during the rain especially if lightening is in the area. Let’s check out my favorite rides to enjoy when the rain starts! 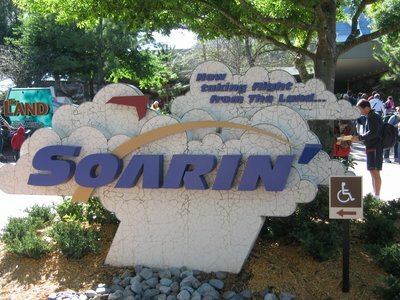 Soarin. How can you not love this ride. Totally indoors, in the dry and air conditioned Land Pavilion in Epcot. This ride handles all weather very well! Pirates of the Caribbean. This ride is housed totally under cover and it loads pretty quickly which makes it a nice option as a filler if you get hit with a brief rain storm. Proximity to many rides that will close during a storm also makes it a good bet. Star Tours will take you to a galaxy far far away from rain in Hollywood Studios any day of the week! Carousel of Progress. This ride is a nice lengthy indoor spin through the history of progress. If you happen to be in Tomorrowland or nearby when the skys open up, this is a great way to pass the time as you learn about time passing! Probably one of my favorite indoor attractions that doesn’t usually have any wait is Mickey’s Philharmagic. A fun show that will keep you laughing and dry both in the waiting area and in the theater. What are your favorite rainy day rides? Tell us here! This entry was posted in Top Five and tagged disney in the rain, rain at walt disney world, rain in florida, Rides in the rain, Top 5. Bookmark the permalink.